a Division of Southeast Cooler Corp.
Polar Temp is proud to present our expanded catalog of refrigerated trailers and truck bodies. For nearly 20 years, Polar Temp has been manufacturing complete refrigeration systems and complete refrigerated storage that have exceeded customer expectations and have provided many with the necessary equipment to run their businesses. We use our refrigeration knowledge and years of experience in the ice industry to drive our company towards new and exciting products. When you purchase from Polar Temp, expect reliable performance, high-quality parts, and dependable service. New refrigeration configurations increase our current selection of refrigerated trailers and truck bodies to over 45 different models! Using a powerful R404A refrigeration system, our units stay colder and protect your temperature-sensitive cargo. 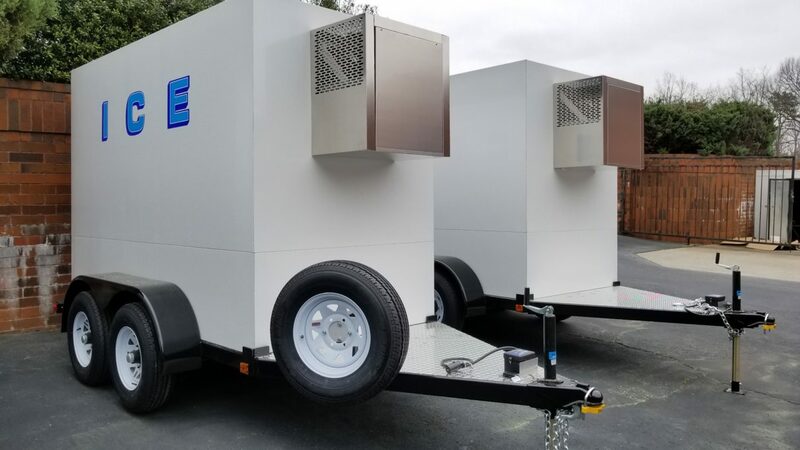 More unit sizes, 3 different refrigeration styles and a wide selection of unit features and options make Polar Temp the industry leader of mobile refrigerated trailers and truck bodies. Our trailers are highly sought after for their versatility and unrivaled value. Invest into the future of your business and choose Polar Temp for your next equipment purchase. All Polar Temp products are proudly made in the United States but are shipped and delivered to locations around the world. From sunny Florida to our neighbors in the North, you can find Polar Temp products working efficiently and effectively in a variety of environments. We test every unit that we manufacture to ensure that everything works and is ready to tackle the rigors of the road. Our customers have high expectation from us and industry experience and knowledgeable staff help us meet those expectations. Have any questions for us? Call one of our knowledgeable sales team members or send us an email. We review and respond to all inquiries within a 48-hour window. A couple of refrigerated trailers ready to be picked up. Polar Temp refrigerated trailers help hundreds of businesses across the US every day. Customers use them to transport food and perishables to far-off locations. Restaurant owners can store excess stock in their trailer when their walk-in freezers are full. Regardless of what you use it for, a Polar Temp refrigerated unit is a sound investment that will provide many years of service. Cold Barons from Montreal, Canada, have been a client of Polar Temp for the last 5 years and we have always been extremely satisfied. We are very pleased with Polar Temp's products as well as the quality of their service. We have been purchasing equipment every year for rental purposes. Their unique, easy to use and versatile cold wall units are very appreciated by our customers and ourselves. They are well built and tough. Polar Temp offers quality products with a very competitive price. We have no doubt that they will satisfy your need for refrigeration. Enjoying my new refrigerated trailer! I am a fifth generation farmer and manage a fully operational farm. We grow and sale fresh certified naturally grown produce at the various farmers markets around Georgia. As a result, I needed a refrigerated trailer to help with transporting the produce. Polar Temp was able to build and customize one to fit my specific needs. It has kept my produce at just the right temperature during the hot Georgia spring and summer which, in turn, helped my produce maintain its freshness for our customers. I had a really good experience with the service provided by Becky, Jim and Brian. The trailer was completed on schedule and with the additions that I wanted. If other farmers are looking for a refrigerated trailer, I would definitely suggest making Polar Temp your first call. I have been buying Polar Temp merchandisers for many years. They look great and the dependability has exceeded my expectations. The need for repair is minimal and the service from the Polar Temp team is exceptional. I would recommend Polar Temp merchandisers to anyone in the ice business. When you need long term durability and great service, Polar Temp is the only choice.